We woke up this morning to a somewhat yucky day outside. It wasn’t raining but it had been and it was overcast. This put a damper on the boat projects Dan wanted to accomplish and neither of us was really feeling much like working. So, what did we do? We got dressed and headed outside. It was time for some fresh air and a good long walk. We headed first to A.H. Reed Memorial Park. It’s a park here in Whangarei that is known for it’s Kauri trees. These huge trees remind me of giant redwoods. They are one of the mightiest trees in the world growing over 50 meters tall with trunks as much as 16 meters around. They have been living for thousands of years and now are endangered due to what they call “dieback”. The movement of soil particularly around their roots spreads a fungus type disease that is killing them. In order to even enter the park you have to clean your boots and have them disinfected which was something we’ve never experienced before. The even ask you to do it on the way out. We parked at the lower car park and took the Alexander track up through these beautiful woods. We came to a fork in the path and took a left over the wonderfully done wooden walkway. It is so high up you are actually in the treetops! At the end of the walkway are several huge Kauri trees. They are absolutely magnificent! After admiring God’s grand creations we made the loop back to the car park. The entire trip was about an hour. From there we drove to the top level car park. Yes, we could have hiked there but the website says it’s a pretty steep trail and sometimes my asthma just won’t let me hike such difficult trails. That’s okay though. We arrived at the top car park which is the beginning or the end of the McKinnon track. After a short ten minute, easy hike we arrived at a wooden platform that looks out over the Paranui Falls. It was actually quite beautiful. The sun was out and sparkling on the falls and the fern-like Ponga trees were perched to the right of the falls. I just love these trees. Next to the Pohutukawa trees these are my favorite of the New Zealand trees. They are like a forest style palm tree. With both journeys taking just about an hour and a half we were still interested in seeing more. After all, the sun had come out and made a beautiful, warm day here in Whangarei. So, we left the park and headed to Abbey Caves. We’ve read about them too. They are just about fifteen minutes from the Town Basin and from what we’ve heard you can see glowworms in these caves. The Arachnocampa Luminosa Glowworms are only found here in New Zealand and most caves where you can see them charge for the pleasure. These three caves are completely free. Of course with that comes the element of danger and a big risk if you don’t have the proper equipment. It was a beautiful hike with lots of wildflowers and huge trees. There was what we believe to be a Norfolk Pine that was absolutely massive! And, everywhere we looked in the valley we saw giant rocks rising from the tall green grass. We found the first cave known as Organ Cave. Dan made his way to the entrance but I wasn’t so sure. First of all we didn’t have a torch and it looked pretty doggone dark in there and secondly Dan said the rocks at the entrance were wet and very slippery. I decided I’d wait to do my cave dwelling until we make our trip to the South Island where we will have professional guides takes us into Waitomo Caves to see the glowworms. There we will actually take a boat ride through the cave to see them! We explored down the path a bit more and then decided it was time to turn back. Now for the UPHILL part of the trek. Here’s where the real exercise comes in. It actually didn’t turn out to be that bad of a walk back to the car but I’m sure my thighs and calves will tell a different story in the morning. Of course Grape Ape had the time of his life climbing in the trees and running in the fields. And, for a reward for the exercise we got today we headed to Frings, one of our favorite hangouts here. They have ice cold beer and great pizza. We tipped a couple of cold ones and then went to another favorite spot, The Judge House of Ale. It was a nice way to end a beautiful day that started out kind of icky! 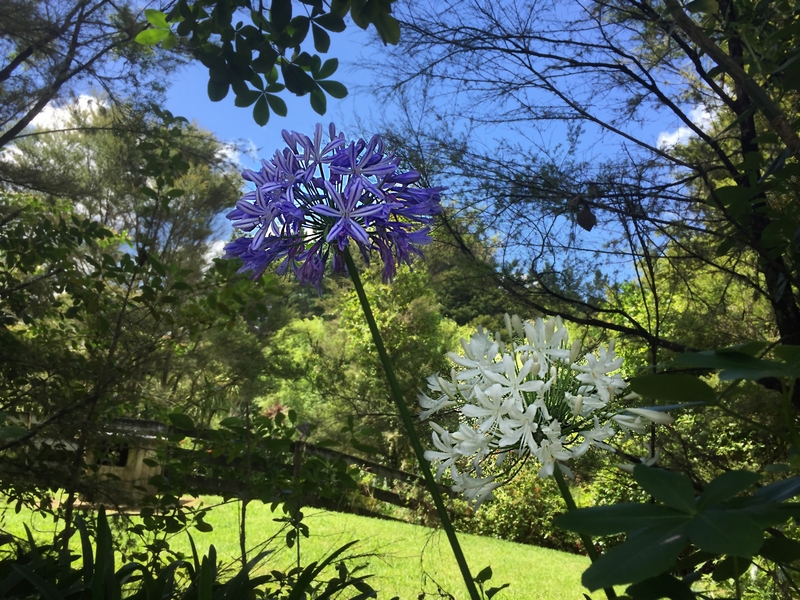 CLICK HERE TO SEE MORE PHOTOS OF WHANGARIE’S BEAUTIFUL PARKS!